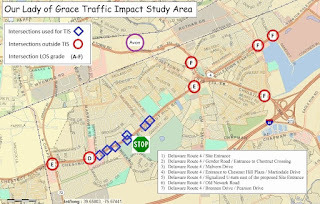 The TIS (Traffic Impact Study) for the Chestnut Hill "Preserve" was completed in Sept 2016, according to the project website. 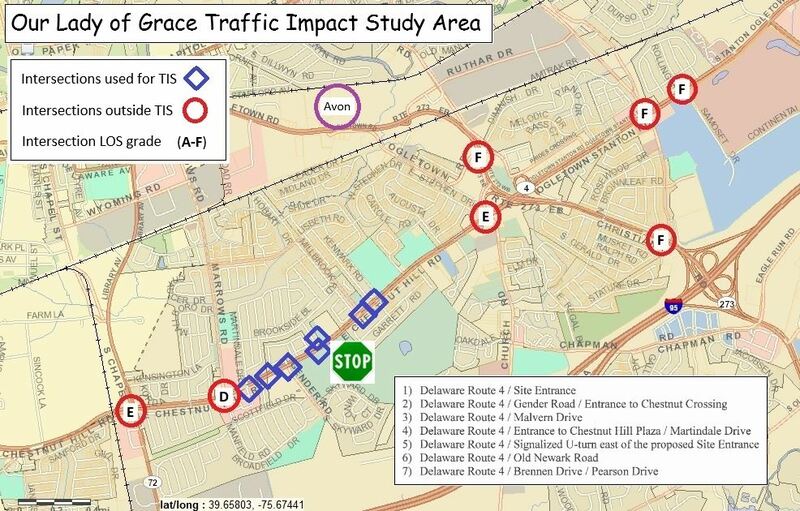 Several items stand out, including DelDOT's recommendation not to "upgrade" already failed intersections at Route 4/South Chapel and Route 4/Salem Church. Just further east is Route 4 through the Harmony and Samoset intersections, the latter of which scores an "F" in LOS (level of service) and becomes a virtual parking lot during peak hours. It's a foregone conclusion that, where commuting and shopping goes, most car trips will be in the eastbound direction, further exasperating an already oppressive corridor through Ogletown. The Avon Redevelopment Project has been all but halted by a failed TIS. Avon is a project that most everyone can get behind. It's an old industrial site, and a project here would not only clean up a Brownfields, but could bring jobs and a bit of place-making to the area. 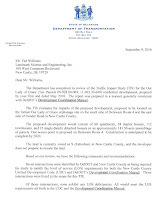 However, a failed intersection -- Route 273 at Red Mill Road -- will require the developer to spend $1M+ to add additional lane capacity. "Improvements" must keep it at a congestion level "D" or better, accounting for its generated traffic. Take a moment to examine our TIS map above, that plots failed intersections vs what was actually studied. Note the Avon project, marked with a lavender circle. Now compare that, relative to the Orphanage Property (marked with a green stop sign). You can clearly see that the intersections -- residential side streets and median turns -- were carefully chosen to keep the study area away from nearby failed signalized intersections. These failed intersections are roughly the same distance away that Red Mill Rd is from the Avon site. In fact, three "F" grades literally wall us in to the east. Marrows to the west scores a "D", and could be pushed to an "E" with the added car trips. Route 72 is already an "E" and might go to an "F". Is the Unified Development Code (UDC) being justly applied? Our Legislators and Council should be actively investigating. It appears that the rules for conducting key project studies may be ripe for manipulation. For example, DelDOT and NCC each have their own standards on TIS scope and coverage; maybe we're seeing some mixing and matching to achieve the desired result? 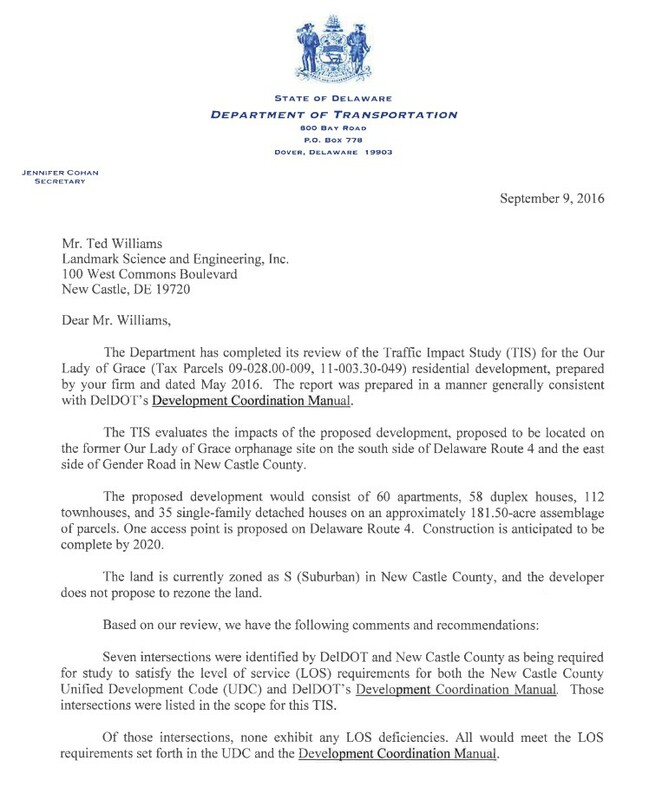 According to Vic Singer, past Chair of the New Castle County Planning Board, a TIS is supposed to include 3 or more signalized intersections away from any proposed development project. In summary, developers not only get to choose who performs their TIS, they are also allowed to use nearby residential streets, median turn lanes, and U-Turns to keep it all within a very small radius. This helps ensure that the actual problem intersections -- those that are signalized and failing level of service (LOS) -- fall outside the study area. Advocates must reclaim a UDC that is under heavy threat by developer interests, and is slowly being eroded. NCC must keep it to where ordinary citizens have the right to defend their quality of life, personal safety, and the environment from big moneyed interests. Sounds like the state has joined the county in betraying local residents. Remember on election day.